When embarking on any new project, it's an excellent, fresh and unique opportunity to start creating something compelling. It is in the role of the L&D manager, where you assist in the organization's success by coaching and developing people, where lies this excellent opportunity. For all the ins and outs of best practices for L&D managers, keep reading about Inno-Versity's approach towards creating custom eLearning solutions for corporate training. Besides content and delivery, there are much broader features to consider when creating and planning a custom eLearning solution. As an L&D manager, you can utilize strategic planning, communication, design, and Project Management. As a matter of fact, you must utilize these components to be able to facilitate a tailormade eLearning solution which is built to last, and creates a lasting impression at the same time. It's a well-known fact that it's important to follow the latest trends in the niche, and especially significant to keep up with digital learning trends; an ever dynamic environment which opens up new possibilities to consume content on a daily basis, where staying behind equals destruction. Not actual destruction but you get the picture. The free Book Providing An Amazing Custom eLearning Solution For Corporate Training will tell you exactly which guideline to follow when it comes to trends, for current practice, and for future use and application. 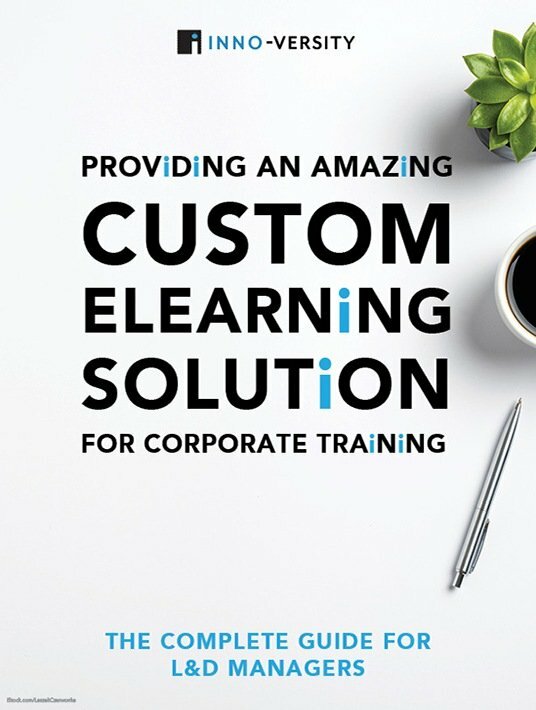 Inno-Versity offers a marvelous custom eLearning solution for corporate training and provides a complete guide for L&D professionals. Inno-Versity makes the case that digital learning wins the budget discussion in the end. It's cost-effective and, if chosen expertly, can reap the reward of the product's promise. Even though there might be a severe cost involved, the Return On Learning can be immense if you choose a digital learning product that fits the needs of your company. Besides costs, L&D managers also need to keep several other elements into account. First of all, customizability; which eventually enables all employees to learn of their brand and company as much as possible. Some other value-drivers of eLearning to keep in consideration, when you are investing in custom eLearning solutions, are flexibility, trackability, and scalability. How flexible is your eLearning module? How trackable are the results and all the data? And finally, how easily can you scale your current module to an unexpected growth of 500 new employees? You never know how well business might be going. The free eBook Providing An Amazing Custom eLearning Solution For Corporate Training proceeds to reveal to us which levels of interactivity exist. More importantly, it helps sketch an overview of when and where to apply which level of interactivity. How do you resolve the issue of concluding which level of interactivity is most appropriate for your training solution? Inno-Versity has got you covered. It is a magnificent starting point to help define in which direction you should be heading in regards to your training. From the risk of the work to the complexity of the content, from discovering who your audience is to being aware of how much in depth you actually need to provide content. They offer some very relevant guidance along the way. The "strategy" element of Project Management is really demanding for any L&D manager. This eBook helps gain considerable insight into the value of some strategic planning by describing the nine stages of the custom eLearning development process. A well-defined strategy with clear set goals helps crystallize the result. To make sure that the process is continually being safeguarded, from start to finish, given the long-term nature of this strategy, it's important to define clear and traceable program objectives. This free eBook is a great base to start from, as it will help you adapt the training to your company's culture, gauging learners' needs, managing content, all the way to the evaluation and revision of the entire process from the start. If a "goal without a plan is just a wish", you better wish hard for the project to come to a superb ending. 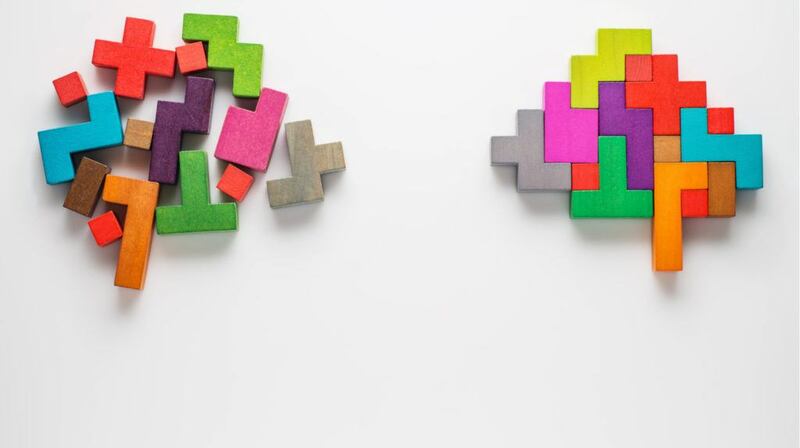 Clear strategies and sound foundations will help realize your goal as an L&D manager. Get all of that in place before you even consider starting. Desired outcomes are merely realized with the assistance of a plan. Some say these plans include nine steps. I say it does too. In the extension of working strategically, Inno-Versity also dives deep into managing risk by anteing up on your strategic game. However well you believe you know the content, the culture, and the processes involved, this way you mitigate risks along the way. The dynamicity and evolution of your custom training progresses towards a climax when you implement a proactive approach with online learners. They are the ones able to finetune the result. Knowing how to funnel down the complexity of the project which you have got ahead of you, already puts you at an enormous headstart; knowing that you have a set of tools, and additionally , being able to facilitate the efficiency of your project by simplifying it for yourself. This clarifies the entire custom eLearning development process; from how knowledge is manifested, the tone in which training content is displayed, the eLearning authoring tool to be used, including the delivery method. The last thing you want to happen is to see the wood for the trees (in a neverending fashion.) You can have all the tools in the world, the bravado to undertake this mega task and the incentive to change the world. But you need a guideline, a professional instruction to deliver a comprehensive product. You need tips on how to measure the ideal results. Above all, you need the ideal eLearning company to develop a custom eLearning solution. If you intend to start anywhere, start here. The free eBook Providing An Amazing Custom eLearning Solution For Corporate Training provides excellent information about basic approaches and methodologies which are required to guarantee optimal digital learning experiences.